Abstaining from food and beverage, other than water, for a period of time (a.k.a fasting) has been used since the beginning of time out of necessity for survival, spiritual reasons, and health promotion. 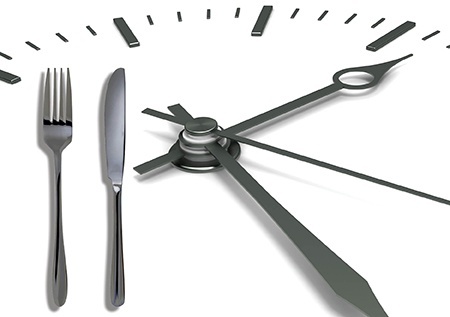 Intermittent Fasting (IF) is an eating pattern that goes between days of fasting or partial fasting and eating. IF has become increasing popular in the health and fitness arena for its perceived role in weight loss and improved health. Here we’ll tell you more about it and give you Dr. Sears’ take on this old concept but new trend. Calorie restriction is the reduction of calorie intake without compromising nutrition. Calorie restriction has been shown to be the most effective way to help slow down the aging process. A recent study showed that restricting calories over a two year period of time slowed metabolism and reduced oxidative stress, two key pieces for reducing the rate of aging and protecting against age-related disease (1). Intermittent fasting (IF) tries to replicate the benefits of calorie restriction, without having to continuously restrict calories. The idea being that not restricting calories daily makes compliance easier to follow. IF involves restricting calories 1-3 days per week and then eating as you normally would on your non-restricted days. There are several approaches to Intermittent Fasting but the premise is you eat normally a few days a week and drastically cut back on calories the other days. This form involves a day in which food and beverages (other than water) are completely restricted followed by a day where foods and beverages can be consumed normally. There are variations within alternate day fasting as well. A more scientifically investigated form involves eating 25 percent of your needed calories on one day and then 125 percent of your needed calories on the next day. The total calorie intake would be 75 percent of needed calories (2). Some calories can be consumed on fast days but it’s severely restricted to 20-25% of your energy needs (approximately 500-600 calories). This is the basis for the 5:2 diet where you restrict energy two non-consecutive days and then eat normally the other 5 days. This involves daily fasting intervals ranging from 12-20 hours. Religious fasts often use time-restricted feeding (i.e. Ramadan). The science on calorie restriction (CR) itself is strong, but what about using the IF approach to calorie restriction? Many of the benefits of intermittent fasting such as improved metabolic profiles, decreased weight and reduced risk for chronic disease have been widely studied in animals. Despite the success of those studies, the same benefits are mixed when it comes to human trials (3), which may be related to compliance. In studies comparing similar caloric intake using both IF and CR there are no differences between the two groups in either weight loss, improvements in blood markers (glucose, insulin, lipids, inflammation) and chronic disease risk (4). Both may be equally effective for weight loss and cardio-protection. In one series of carefully controlled long-term trials (the CALERIE studies), the goal was to have individuals reduce calorie intake by 25 percent on a continuous basis. Even though individuals could only reduce their intake by 15% these calorie restricted (CR) experiments demonstrated significant clinical benefits (1). The data is clear that if you can restrict calories there are benefits to be gained. Intermittent fasting is based on the idea that continuous calorie restriction is too hard to follow for the lifetime. So maybe you can do it for a couple of days with fasting or mini-fasts, knowing you can eat normally or overeat the next day or every other day. Regardless of the approach used, the answer appears to be that there is no benefit of intermittent fasting compared to consuming the same number of restricted calories day in and day out according to recent studies. Furthermore, there is no difference in weight loss between a continuous calorie–restricted diet and an intermittent fasting diet because the weekly intake of calories consumed is about the same. However, subjects in these studies using intermittent fasting tend to be less compliant as they are hungrier on their fasting days. The key to the Zone Diet is not simply the restriction of calories, but the constant maintenance of hormonal balance that results in stable blood glucose levels so that you are not hungry between meals. After all, who wants to be hungry no matter what the potential health benefits may be. In addition, if you use Ramadan as an example in which observant Muslims who fast all day and then only eat after the sun goes down, you see that they do lose weight, but the lost weight is all regained shortly after the fasting period is over. This isn’t ideal for long-term health benefits. In addition 16 hour fasts may place stress on your bodies hormonal systems as one may run the risk of upsetting the hormonal levels like insulin, glucagon, and cortisol. The Zone Diet is built upon the concept of calorie restriction coupled with hormonal balance, so that you are never hungry or fatigued and can easily follow it for a lifetime. Following a calorie restricted Zone Diet will yield many of the clinical positive benefits often attributed to various forms of fasting but with greater long-term compliance. 1. Leanne M. Redman, Steven R. Smith, Jeffrey H. Burton, Corby K. Martin, Dora Il'yasova, Eric Ravussin. Metabolic Slowing and Reduced Oxidative Damage with Sustained Caloric Restriction Support the Rate of Living and Oxidative Damage Theories of Aging. Cell Metabolism, 2018. 2. Trepanowski JF, Kroeger CM, Barnosky A, Klempel MC, Bhutani S, Hoddy KK, Gabel K, Freels S, Rigdon J, Rood J, Ravussin E, Varady KA. Effect of Alternate-Day Fasting on Weight Loss, Weight Maintenance, and Cardioprotection Among Metabolically Healthy Obese Adults: A Randomized Clinical Trial. JAMA Intern Med. 2017 Jul 1;177(7):930-938. 3. Horne BD, Muhlestein JB, Anderson JL. Health effects of intermittent fasting: hormesis or harm? A systematic review.Am J Clin Nutr. 2015 Aug;102(2):464-70.